A new release again. I’m preparing the code for future changes (like support for backwards counting meters, etc). So this release is mostly about code improvements instead of functional improvements. But still there are some. See the changes below. @mitchmario Thank you for sharing your design on what the card could look like. Very inspiring. All zero values are suppressed. And values on the arrows are visible only when relevant. E.g. 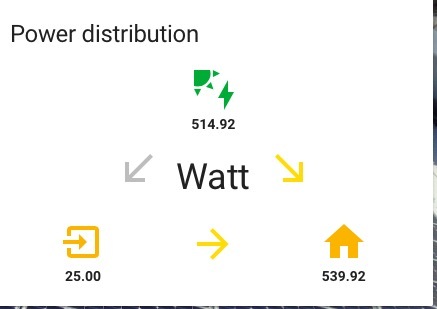 on a sunny day when part of your produced solar panel energy was returned to the grid and the other part was consumed by your home. More-info dialogues for arrows that are related to a sensor. Immediate response when you click on the unit to toggle between views. Using the local version of lit-element. 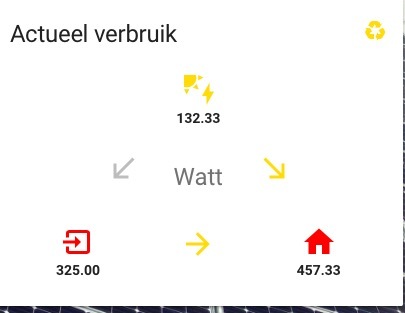 More-info dialogues only for icons that are related to a sensor. Reduced clickable area for toggling the view. Ill take it out again, and wait for a next version, hope you’ll be able to sort things out. But no sarcasm on my side here. Let’s explain what’s going on with the values: The card can’t handle input sensors well that give values that were measured on different times. 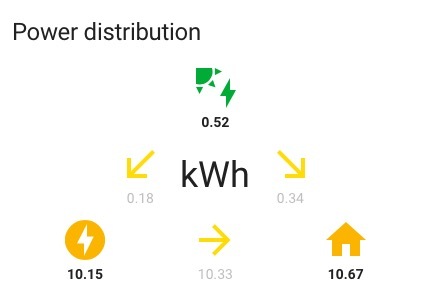 In above example (I took your image) the solar energy input sensor gave a 0 and the grid energy production sensor gave 0.18 kWh. That is an invalid combination in itself which couldn’t happen in real life, but can happen in HA. Because the sensors are measured by HA on different times. I myself am blessed with input sensors that update both every 10 seconds. But if the solar sensor is updating every minute (for e.g.) and the grid sensors are updating every 30 seconds, you could get into this problem. Maybe the card should check these temporarily invalid input combinations, but I could check only for detectable invalid situations and the undetectable invalid (but still invalid) combinations still wouldn’t be detected because they are obscured by the data itself (= you can’t write a if-statement for it). Since you are also experiencing performance issues as well, the timing effect could be magnified by the performance issue. About the performance issue. Although I have 116 components running in HA and don’t have performance issues, that doesn’t help you of course. But on the other hand, I could mean that you have a very specific situation that I can’t reproduce. Maybe other users of the power-wheel-card can confirm (or deny) any performance issues with version 0.0.8 that they could relate to the card? One thing that comes to my mind is that if you have problems with the /dev-state en /dev-template pages of HA, that that is related to the backend of HA. The card runs completely in the frontend that resides in your browser not in the backend. To be clear: if you switch off the card, you don’t experience any performance issues? And do you see any errors or warnings in the console of your browser? There should be none. not sure. 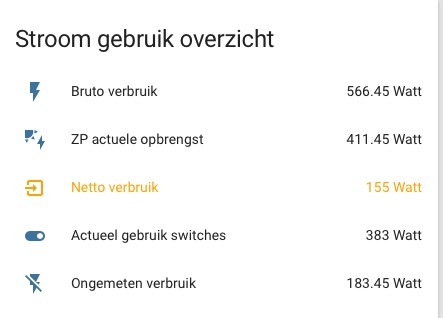 most of my sensors are updated real time, and my netto_verbruik sensor, and its templates, are updated every 10 seconds I think, its the DSMR that updates these. I am a heavy user, admitted, use 128 components. but they all fare well. Well mostly, only Hue has some issues, but apparently that is only the messenger of I/O going on. As I can see with using your card, Hue light show unavailable … (other story) It does signal that it burdens the system. would this reflect your design better? the response to the centre toggle is immediate, so that’s much better indeed. Still, everything happening in the frontend does take its toll, especially with much customization going on. Not sure if that’s cause for relieve or sorrow. Thx for your extensive response. Yes, now the images do reflect the current design. I found some hours this evening to dive into possible performance improvements. Found something in lit-element about the shouldUpdate() function that could help. What’s happening? HA gives each custom card a large hass property. Cards check this hass object for changes in entities. By default HA and Lit-element cards are designed to update each visible card on every change of every entity (= automations, sensors, scripts, etc, etc). For large HA setups with many entities this can become a problem if you combine it with one or more of the heavier kind of cards. I made a change to the power-wheel-card to update the card only on specific entity changes (e.g. all the input sensors). That should skip a lot of unnecessary updates and should free some browser resources. There’s a version 0.0.9-dev available on the dev branch in the repo if you want to give it a try. But since HA updates the visible cards only, you could also/first try to temporarily isolate each heavier kind of card on a separate view in Lovelace to test things. This approach could help to pinpoint the performance problems to a specific card. I hope the dev-release and the test approach can in the end solve some of your performance problems, if not all. There’s a version 0.0.9-dev available on the dev branch in the repo if you want to give it a try. the missing 0 under the sun icon is a bit too clean for me… In fact, it gives an uncertain feeling as the sensor isn’t picking up alright. 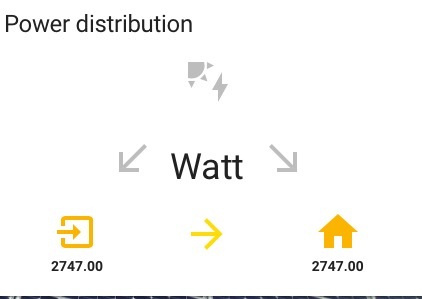 I’d prefer it if no solar production is available to have it show 0 under the icon. 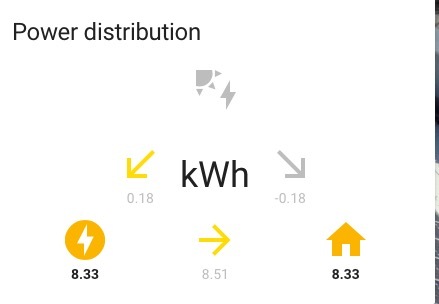 secondly, what would really be nice is if the title of the card were to change along with the view, and show, Power- Watt, Usage/Energy -kWh and Cost (which sound better than Money iyam) instead of the Power Distribution or whatever fixed title we give it, it is showing now. after having taken out the mini-graph-card and letting it run for more than a day, I can report most of the performance issues have disappeared. (loading the page still takes out the Hue lights…) Apparently the combination of the 2 cards causes trouble. Not sure how and what to ask to check what could be the cause for this, but please let me tag @kalkih here to have a look? fyi, I am using HA 084.3. Have taken your two suggestions into account already. And I’m following your discussion on performance in the mini-graph-card topic with great interest. And I’m following your discussion on performance in the mini-graph-card topic with great interest. 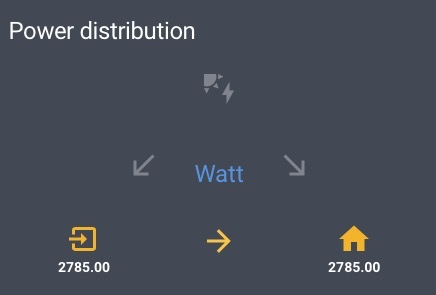 got a question - I have an Enphase system using an Envoy-S, which provides grid consumption and array production data - is anyone using this card with an Envoy, if so how are you calculating grid export? Solar panel installation. Which Inverter? Hi @DrewXT, I saw you’re getting support already in another topic by @exxamalte . Super! I understand the naming of the card parameters can be confusing. I will add some more explanation to it in next release. (I want to postpone changing the parameter names itself for a while since that would cause a breaking change and people are still recovering from the last breaking change. ). Have taken your two suggestions into account already. trying to use the coloring options, I am a bit puzzled though if what I want is already possible. First: am I correct the icons don’t color along the customizations set for the individual entities in the HA setup? right now we have 2 options, and they go for all icons I think, which could be made more insightful. Time for a new release of the power-wheel-card. Set a different title per view by using optional card parameters title_power, title_energy and/or title_money. All three card parameters default to the value of card parameter title. Auto-toggle between views. Click the recycle icon to turn on and off the auto-toggle. The initial auto-toggle state can be set by optional card parameter initial_auto_toggle_view. The period between views can be set by optional card parameter auto_toggle_view_period (in seconds). Performance. Update only on specific changes of the hass object. 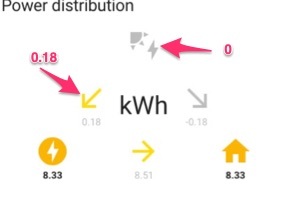 Don’t suppress zero values on solar, home and grid icon; only on arrows. More explanation in the readme about which sensor to use for what card parameter. Power-wheel-card is still in beta. You can expect breaking changes in future releases. You can choose to not color the 3 icons at all. Use color_icons: false which is default. You can choose to color them automatically. Producing icons will turn green. Consuming icons will turn yellow. Use color_icons: true. You can choose to have your own colors for producing and consuming. Use consuming_color: and producing_color: for that. You can set a theme in HA and the power-wheel-card will use --label-badge-yellow of the theme for the yellow color, etc. automatically. Your coloring requests go beyond these out of the box features and are not supported. Can you give an example of how the entity attributes will look like if there is a custom color dynamically set by some other component? 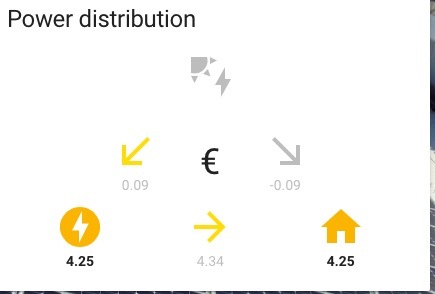 would be really nice if we could set these customizations, but for the Home icon bottom right, that would not be possible would it, since the card calculates that? And what do the attributes look like when you look up the sensor in the /dev-state page? Do they get a color attribute e.g.? no I don’t set a color in that template but a theme. Could be a color of course, that is, icon_color (see my commented icon_color template). 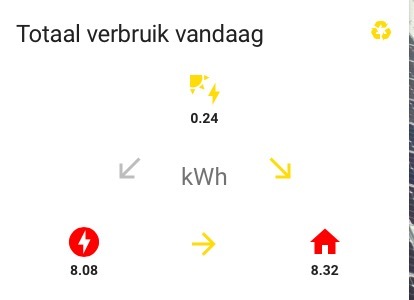 while returning to the grid is green and consuming from the grid is red. 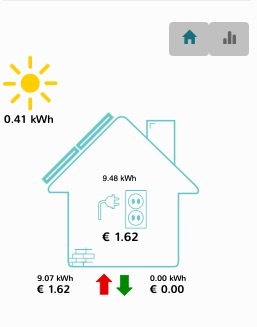 as your an see here the kWh view combines with the money view, which is quite effective. Might be a good idea for your card also? And what about inverting the grid color? separate post, because this could be something to point out for reference and use for others. Almost but not quite. Because now you want to use exactly the same value_template for both sensors. But I like the idea. You could use a min in the latter, but don’t forget to abs in the end then. why? 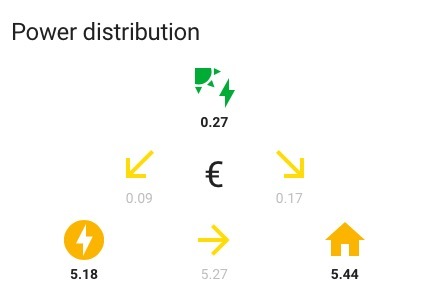 the sensor.netto_verbruik shows the positive usage when consuming, and a negative value when returning. using an |abs on a positive value does nothing, and on the negative makes it positive, as is required by the card.